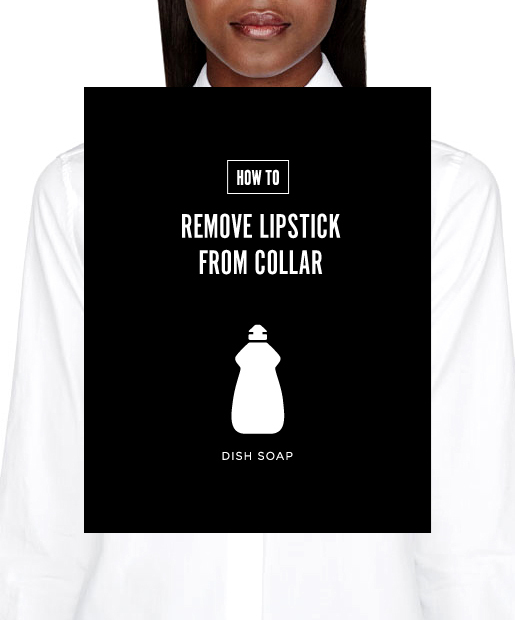 Lipstick Stains On the collar: Bright red lipstick usually finds its way onto any nearby collar, whether you're giving an acquaintance an awkward hug-pat or you've somehow managed to smear it on your own collar (guilty). We spoke with cosmetic chemist Karoline Wells of The Elixery Cosmetic House in Minneapolis, who admits that she has to remove a lot of pigments from clothing in their laboratory. "The best way to remove lipstick from fabric is to use plain dish soap," says Wells. "Dish soap contains extra degreasers, which are very useful in removing lipstick. This is because the pigments in lipstick are ground into an oily base, so anything that dissolves the oil will help dissolve the lipstick pigment." Wells says you should apply enough dish soap to cover the stain, and then let it sit for a few minutes to "do its magic." Rinse with hot water, and repeat until the pigment is gone.